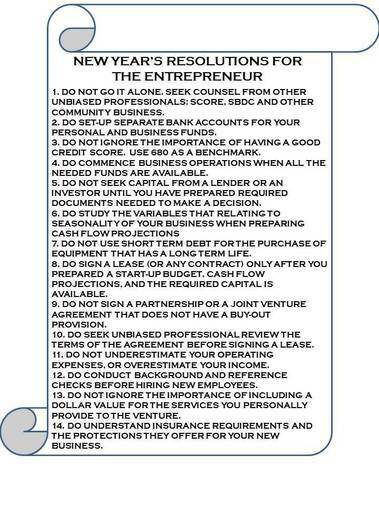 Brought to you by the U.S. Small Business Administration South Florida District Office. Serving the Sunshine State's 24 counties south of Orlando: Brevard, Broward, Charlotte, Collier, Desoto, Glades, Hardee, Hendry, Highlands, Hillsborough, Indian River, Lee, Manatee, Martin, Miami-Dade, Monroe, Okeechobee, Osceola, Palm Beach, Pasco, Pinellas, Polk, Saint Lucie, and Sarasota. TAMPA - This day-long event will provide small business owners and entrepreneurs in-depth information for getting capital to start and grow a business. 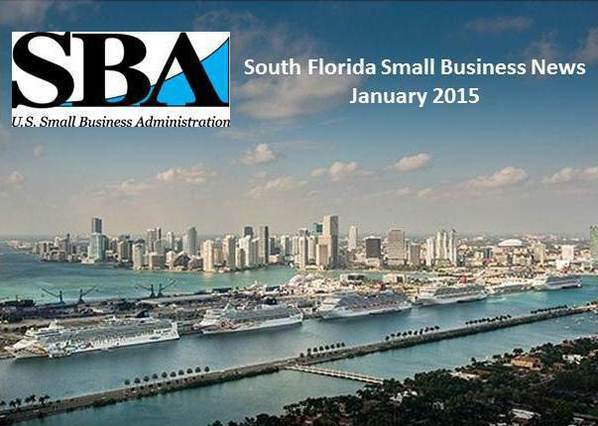 MIAMI - Join Miami Dade SCORE and SBA South Florida at the Miami Small Business Expo, Miami Beach Convention Center. ST. PETERSBURG - Learn what the law means for small businesses as well as key provisions of the ACA, based on the size of your business. Happy New Year! As we begin our new 2015 calendar year, our first quarter fiscal year begins strong. As of Dec. 1, SBA approved 334 loans for $161.8 million for a 54% increase in loan numbers and 62% increase in dollar volume over the same time frame last year. SBA announced Dec. 19, that its Emerging Leaders initiative will return to Miami and debut in Tampa this spring. South Florida is one of only two SBA districts selected for two classes. I think this reflects the attention being given to small business in our district. Our district staff is participating in several Affordable Care Act presentations this month. This year, Florida small businesses with fewer than 50 employees can purchase a plan through the federal healthcare website (www.healthcare.gov) or find a registered insurance broker to help small business owners find the right plan. Take advantage of these in-person events or one of many online webinars. You can find the best one for your schedule by visiting our events calendar online or register to receive our weekly events newsletter. Free or low-cost business training workshops are scheduled throughout the South Florida District through our network of SCORE resource partners! Click on the links below to find a class this month near you! Free or low-cost training workshops on a wide variety of business topics from financing to government contracting are available statewide through the Florida Small Business Development Center (SBDC). Their schedule of workshops can be found HERE. For women entrepreneurs, three women business centers offer training for you at four locations. They are: Florida Institute of Technology Women Business Center; Florida Women's Business Center; and The Centre for Women (Tampa). MIAMI – Join SBA South Florida District every Tuesday morning on the Pete De La Torre Business Hour radio show where we "Talk SBA". The segment airs on WZAB radio 880 AM "The Biz" at 8 a.m. Listeners outside of Miami can listen ONLINE. 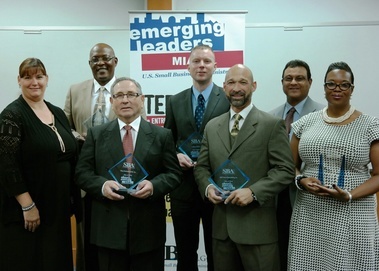 WASHINGTON – The U.S. Small Business Administration has launched its 2015 Emerging Leaders executive-level training series in 48 cities and communities across the country. The series will return to Miami and debut in Tampa this year. The initiative has trained more than 2,400 promising small business owners in underserved communities, and its impact continues to expand in helping small businesses to grow and create jobs throughout the country. Tampa is one of 22 new cities joining the initiative for the first time. Six of 13 students braved south Florida traffic and inclement weather to attend graduation ceremonies of the inaugural Miami Emerging Leaders class, Nov. 19. Deputy District Director Jonel Hein (left) presented awards and Moises Montanez (third from right), owner and president of ALTA Home Remodeling provided the class testimonial. On Dec. 5, the Bureau of Labor Statistics reported that our economy added 321,000 jobs last November. That’s 57 consecutive months we’ve added jobs – the longest employment growth streak since America started keeping track. November 2014 also marked 10 straight months we added at least 200,000 jobs – a first since the tech boom of the mid-90s. Millennials, born between 1980 and the mid-2000s, are the largest generation in the U.S., representing one-third of the total U.S. population in 2013. Millennials are a technologically connected and diverse generation. Their unprecedented enthusiasm for technology has the potential to spark change in traditional economic institutions and the labor market. The priority that millennials place on creativity and innovation make them an important engine for the U.S. economy for decades ahead. Despite their promise, unemployment remains high among millennials; one in four are experiencing unemployment. Millennials who grow up in underserved communities face even higher rates of poverty and unemployment. Young African-Americans and Latinos under the age of 25 are twice as likely to be unemployed. The Women's Business Center (WBC) at Florida Institute of Technology is here to serve the business community and it has been an incredible year for small business growth in Brevard County. We've seen an increase of 18 percent in client activity this year, having served 56 local businesses and executives through workshops and tailored mentoring programs. We would like to thank all of our sponsors, mentors and volunteers for helping us to meet client needs throughout the year. During the past 12 months, we've worked with clients who have experienced increased revenues exceeding 20 percent and grown to hire more than 40 new employees! Additionally, 17 new business ventures were launched with the help of WBC programs. FORT PIERCE - SCORE which recently celebrated its 50th Anniversary has announced that it helped its clients over time exceeding 10.5 million since its founding in 1964 by offering business expertise and training to help small businesses succeed. SCORE offers in-person and online counseling and chapter workshops and on-line workshops that help aspiring entrepreneurs and small business owners plan and execute strategies resulting in the success of their companies. Both start-up and existing businesses call on SCORE as a sounding board for information and advice. In fiscal year 2014 ended September 30, 2014 SCORE provided 497,000 total services, including: more than 214,400 face-to-face counseling sessions; more than 48,900 online counseling sessions and more than 234,100 attendees at almost 11,800 workshops held. 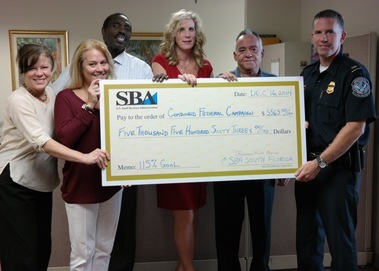 SBA South Florida District wrapped up a very successful 2014 Combined Federal Campaign season with donations totaling $5563.00. The contributions pledged and collected were 115% of the district’s assigned goal. Pictured (left to right) is: District Support Assistant Maritza Perez; District Administrative Officer Tina Davis; District Support Assistant Ralph Johnson; Lender Relations Specialist Kim Prenter; and Program Support Assistant Manny Estevez who are presenting the check to U.S. Customs and Border Protection Agent and Atlantic Coast CFC Coordinator Ruben Aguilar.